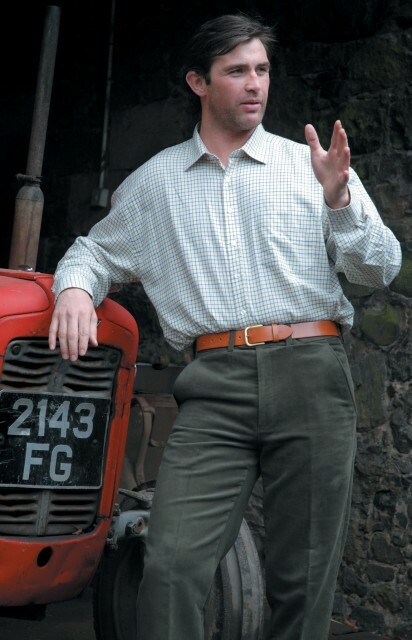 Hoggs of Fife are well known for their high quality and hardwearing country clothing. Their reputation has been earned during the long period since the company was established over 125 years ago. The Hoggs of Fife Classic Countrywear range caters for country enthusiasts, both ladies and gentlemen, and offers practical and stylish shirts, jackets and trousers. At the heart of many countrymen’s wardrobe are the famous Hoggs of Fife Monarch Moleskin Trousers. These definitive country trousers, well-known and loved, are made from Hoggs exclusive 100% cotton Monarch moleskin fabric. Warm in winter and cool in summer, they provide comfortable wear all year round. Topped by a Hoggs of Fife Laird Premier Tattersall Shirt or a Hoggs of Fife Ambassador Tattersall Shirt, an instant country outfit is created. These Premier Tattersall Shirts are manufactured from 100% cotton twill fabric and have an extra long tail to ensure that the shirt stays tucked in. The Premier Tattersall Shirts are an obvious choice as a shooting shirt as well as a general country shirt. When it comes to shirts, ladies are not forgotten. The Hoggs of Fife Bella Ladies Floral Shirt and The Hoggs of Fife Bonnie Ladies Country Shirt are stylish, semi-fitted shirts made from 100% brushed cotton. For extra warmth in the winter, the Hoggs of Fife Alba Jersey-lined shirt is a cosy addition to any ladies shirt collection. New for 2016 will be the Hoggs of Fife Erin Ladies Jersey-lined shirt (coming soon) in an attractive cream and apple check. This is definitely one to look out for. Moving on to country jackets, the Hoggs of Fife Padded Waxed Jacket is a classic British country waxed jacket. With a checked and quilted lining, a traditional green corduroy collar and an anti-wicking nylon drip strip, it is perfect for country enthusiasts to wear for walking, riding, shooting or fishing. Hoggs also offer a Padded Waxed Waistcoat for those warmer days. The British weather often dictates the need for hats and Hoggs of Fife can supply just what you need for country wear! The Hoggs of Fife Moleskin Caps have a traditional deep back design to ensure a comfortable and secure fit and have a classic look. If you need a hat which you can just push into a bag or pocket, then look no further than the Hoggs of Fife Perth Crushable Felt Hat. Made from 100% wool, this felt hat is water repellent, has a wide brim for good protection from the elements and retains its’ shape after crushing. The Hoggs of Fife Waxed Baseball Cap in dark olive has a dark brown waxed leather peak and an adjustable rear band, whilst the Hoggs of Fife Waxed Indiana Hat has a wide brim. Both are made from 100% Cotton Cuprawax. The Hoggs of Fife Classic Countrywear collection also includes some very comfortable socks. Made from a mix of 75% British wool and 25% nylon, the Hoggs of Fife Adventure Socks (available in mid and long length) are cushion loop lined for superb comfort and have moisture absorption properties. They are available in two lengths and a choice of green or navy. These are the perfect pair of socks for wearing inside wellington boots or walking boots. The Hoggs of Fife Classic Countrywear range sits alongside the Hoggs of Fife Field Pro Hunting and Shooting range and the Hoggs Professional range to offer one of the most comprehensive selections of country clothing and footwear in the UK and Ireland.